Check out the online planetarium from Paul Neave. The Neave Planetarium graphics on the page are grabbed from our selected dates, but you can select your own after you arrive to the Neave Planetarium by clicking on the graphic or links supplied. Look at any direction in the sky, look at any date and time, and select any location on earth. Find planets, stars and constellations. 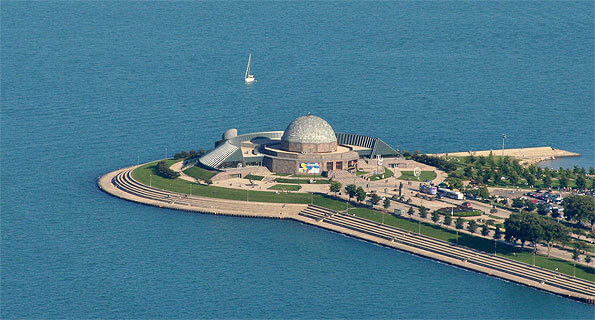 The Adler Planetarium on the lakefront of Chicago. Dropdown menus on the Night Sky page supply links to plenty of helpful astronomy links, such as Adler Planetarium, NASA, Wikipedia topics, and more. Anything interesting about the sky that crosses the desk at The Cardinal: a meteor caught on video, an air show, space flight, natural phenomena, new or classic aircraft, and more. Each winter season, The Cardinal tracks snowfall in Arlington Heights and Chicagoland. UFO sightings from around the world … including follow-ups from debunked sightings.